Thank you for registering for the 19th Annual Novo Nordisk New Jersey Marathon & Half Marathon weekend, which includes the 2015 RRCA New Jersey State Championship race in the marathon distance. In an effort to help make your participation more enjoyable throughout the entire race weekend, this is the third in a series of weekly messages containing important information. Copies of these messages will also be available on our Website. Links to them will be posted on both Facebook and Twitter. • The Full, Half and Relay races will all start at 7:30 am this year. • There are NO speed restrictions for athletes in wheelchairs in either the half or full marathons this year. • The next on-course training run/walk will be held on March 8th, starting and finishing inside the Ocean Place Resort & Spa. Start time is 8 am. Coffee, hot chocolate, water, etc. will be available both before and after your training. Please note: The resort is offering a special Saturday night room rate for those running with us on Sunday morning. Book by calling the resort directly. Brunch will be available at the resort after your training for $24. Expo: Parking on both days of the New Jersey Marathon Health and Fitness Expo is free and open to the public (Fri 1pm-7pm, Sat 10am-6pm). This parking will be inside the gates of Monmouth Park, in the “Grandstand” lots adjacent to the Start Line. Please note: these lots will not be used for parking on race day. There will also be special parking for all VIPs who will receive instructions directly from the VIP Coordinator as we get closer to race weekend. For returning athletes, spectators and staff: while there are a few changes this year you’ll be familiar with the general layout of this floor plan as it’s similar to the 2014 floor plan. For first time attendees: the floor plan layout basically divides the Grandstand building into half lengthwise. The main Expo Vendor area will primarily be on the left, just inside the main entrance. The normal athlete traffic flow will be either straight ahead through the Novo Nordisk lounge area or a slight right to pass beside the Info Desk, Souvenir Shop and into the Race Packet Pick-up area. New this year will be a place to have a bit to eat. Hot dogs/sausage, etc. will be available at a Pub and Hotdog/Deli Stand, which will be located near the beginning of the Packet Pick-up area. Stop by for food, beer, water, etc. If you don’t have your bib number with you for some reason, just head into the Bib Number Lookup Area, step up to a tablet/laptop, search for your name, write down your bib number and take it with you to the proper bib pick-up line. The bib tables will be arranged in groups by each specific race. The group of tables for your particular race will be sub-divided into ranges of bib numbers at each individual table. Which means that you should first look for the line of table(s) for your race and then find the specific table within that grouping which has your bib number in its range of numbers. Once you’ve picked up your bib, t-shirt, race day gear bag, and purchased or picked up any parking, train, or VIP Program tickets, you will also have the opportunity to check out the official race merchandise area before exiting into the Expo Area. Food Drive: Move For Hunger will be accepting donations of non-perishable food items again this year. There is an urgent need for food here in New Jersey, and around the country. Did you know that over 50 million Americans struggle to find their next meal? Sadly, kids are affected in large numbers. Please bring a non-perishable food item to the expo and donate it to the Move For Hunger Team. Each year you’ve donated several thousand pounds of food. Please keep the caring alive in 2015! Used Athletic Shoe Drive: The MORE Foundation Group will be accepting donations of used athletic shoes once again this year, during our expo. Over the past several years, together with your generous donations, we have adopted eight African families and changed their lives forever. I will personally be donating at least 12 pairs of old running buddies. Please join me in supporting this charity’s efforts. Solutions – If something is not as expected with your race registration, bib/timing tag, t-shirt, parking ticket, etc. stop by our Solutions Desk to request a solution to the problem. Registration – If we haven’t sold all of the: 5K, Half Relay, Half Marathon or Full Marathon registrations at the opening of the expo you may be able to register for this year’s races at a bank of laptops in the packet pick-up area (until we reach our cutoff number for each of those individual races). Please note: We have sold out our full marathon registrations and almost sold out our half marathon registrations prior to the opening of the expo in each of the last two years. Please don’t wait until the last minute as you may not be able to register for any of our Sunday races at the expo. Unlike our other races, last minute registrations for our 5K may be available on race day morning, Saturday, April 25. During the expo hours you will also have the opportunity to take advantage of significantly discounted registration pricing for our 20th Anniversary races, which will be held on April 25th, 2016. Registration prices for our 2016 races will increase after the close of the expo, but will still be discounted, as they were in 2014. Tide Team members, or those who would like to become team members: these special expo registration discounts are a way we can help you in your continued support of our event each year. Please take advantage of these once-a-year prices. Elites and VIPs – Pick up your entire race packet (bib # & timing tag, race shirt, gear bag, etc.) at the VIP desk. It’s a one stop service for each of you. Tickets – Tickets/passes may still be available for sale and pick-up at our Tickets Desk if they haven’t sold out. Pre-purchasing tickets is still the best way to ensure your place in our VIP program, Race Day Train and Start and Finish Area Parking. Please note: Guaranteed Finish Area Parking normally sells out before the opening of the expo, so if you’re interested please don’t wait for the expo to purchase that parking option. Once the space is gone we have no way to add more spaces at 7-Presidents Park. Expo Speaker Series: We will again be hosting a series of presentations throughout both days of the Expo. Watch for the details on our website (speakers, topics and times) and an announcement on our social media pages (Facebook and Twitter). 1. Getting to the Start: Carpool and be in the parking lots about 75-120 minutes before the race start (7:30 am), or take the Special NJ Marathon Race Day Train. Click here to register for the train. 2. Post-Race: Getting home: Take a regularly scheduled NJ Transit train, (Please note: these trains don’t stop at Monmouth Park), walk to your vehicle in one of the parking lots near the Finish Area, or take one of our free shuttle buses back to your vehicle at Monmouth Park. 3. Pre-paid parking at Monmouth Park: We strongly suggest this option. Click here to register. 4. Pre-paid parking near the Finish Area: Guaranteed Parking for spectators at Seven President’s Oceanfront Park in Long Branch for $15. Click here to purchase a ticket. 5. Race Day Gear Check: Take advantage of this free service for dry, warm clothing after your race! 6. Race Packet Pick-up: Free at the Expo, paid service on race day morning. Click here to register. 7. Race Day Security Information for Spectators (click the link and scroll down to the “Security Info”). I hope that the information above will help you to better plan your time with us at the Shore this April. Best wishes during your training and on race day! Thank you for registering for the 19th Annual Novo Nordisk New Jersey Marathon & Half Marathon weekend, which includes the 2015 RRCA New Jersey State Championship race in the Marathon distance. In an effort to help make your participation more enjoyable throughout the entire race weekend, this is the first in a series of weekly messages containing important information. Copies of these messages will also be available on our website and links to them will be posted on both Facebook and Twitter. The Full, Half, and Relay races will all start at 7:30 am this year. There are no speed restrictions for the full marathon wheelchair division this year. This section contains important information to help race day go smoothly for you and your support team. 1. Getting to the Start: We are always working hard to ensure that getting to the Start Line on race day morning is as smooth and easy as possible, and look forward to your continued cooperation in helping to reduce any potential delays. a) Take the Special NJ Marathon Race Day Train which will arrive at Monmouth Park Station at about 6:25 am. Click here for the train schedule. Click here to register for our special race day train. Over the years this has proven to be the easiest way to arrive at Monmouth Park for our Sunday races. ii. Plan on being in the parking lots around Monmouth Park about 75-120 minutes prior to the start of your race. Please note: With over 5,000 vehicles trying to get into the parking lots at Monmouth Park, most at about the same time, there can be heavy traffic on race day morning from every direction. Important: Parking lots fill up fast and the closest parking spots are filled first. The last vehicles to arrive may be required to park almost a mile from the start line and will require additional time to walk to the start area. Plan ahead so that you don’t miss your assigned corral (they close at 7:20 am on race day). c) Get dropped off at our special Athlete Drop-off Location inside the Clubhouse Main Gate on Victor Ave. Please watch for signs for that area as you approach Monmouth Park on Rt. 36. Please note: Dropping off athletes in any other location than the designated one is not allowed as heavy traffic makes it dangerous and it will slow down parking for others. i) the relay transition area in Monmouth Beach: for relay athletes and parents/guardians of relay athletes under 18 only. ii) the NJ Marathon and Half Marathon bus terminal on Union Ave. in Long Branch for: spectators, volunteers and race staff. This bus terminal is a block from mile 9.75 of the race courses and within 4 blocks of the finish area. Please note: This bus station is NOT used for transportation back to Monmouth Park. Please see the paragraph below for return busing information to Monmouth Park. 3. Post-Race Transportation: When leaving the Finish Area there are several post-race transportation options to consider. a. Walk to Long Branch Station and take a regularly scheduled NJ Transit train home. Please note: These trains DO NOT STOP at Monmouth Park. b. Walk to your vehicle which is parked in one of the lots around the Finish Area. c. Walk to our Finish Area bus depot (in front of the Ocean Place Resort) for a free bus ride back to Monmouth Park. Please note: Due to road closures from the race, these buses cannot begin the return trip to Monmouth Park until about 9:30 am, and will begin boarding by starting corral order until any backlog has been reduced. We invite you to take advantage of the Finish Line Festival (food, music, raffles, awards ceremonies, cheering for other athletes, etc.) until the busing begins. 4. Pre-paid parking at Monmouth Park: By prepaying the $5 per car parking fee prior to race day exiting the parking lots will be much faster. Otherwise it will cost $10 to exit the parking lots post-race and be slower. We strongly suggest that you take advantage of the pre-paid option. Click here to register for Start Area Parking. Tickets will also be on sale during Packet Pick-up on Friday and Saturday. 5. Pre-paid parking near the Finish Area: We offer Guaranteed Finish Area Parking at Seven President’s Oceanfront Park in Long Branch for $15. Click here to register for Guaranteed Finish Area Parking. Please note: There is no shuttle transportation from this parking lot to the Start Area as it is intended for your supporters and those needing a quick exit after the race. 6. Gear Check: If you would like to have warm/dry clothing available at the finish of your race, please use the official gear check bag which you will receive when picking up your race packet. It is the ONLY BAG you will be allowed to bring into the secure Start Area in Monmouth Park and the ONLY BAG you will be allowed to carry inside the secure Finish Area. Take advantage of this free service to stay warm and comfortable after your race! 7. Race Day Security Information for Athletes, Spectators, Press, Volunteers and Race Staff: Click here to read about the special race day security requirements at both the Start Area and the Finish Area. If everyone complies with the security requirements, these two areas will be simple to get to and fun places to be on race day for everyone. These safety procedures are intended to allow everyone to feel the positive energy and excitement of race day, in as safe an environment as possible. Please note: There will be no exceptions to these security requirements on race day! It is your responsibility to understand them and to comply fully. Please be sure that any race day spectators/supporters read and understand the security requirement which apply to them as well. 8. Optional Packet Pick-up Service: If you aren’t able to pick up your race packet during our normal Expo hours on Friday or Saturday, and can’t find a proxy to pick it up for you for free, we offer a Race Day Packet Pick-Up Service. This service is limited to the first 500 who register prior to the cut-off date, and costs $25. Click here if you wish to register for this special service. On race day plan to arrive early to give yourself plenty of time to pick up your packet, pin your bib on your shirt, check clothing at our Gear Check for the finish line, warm up, etc. 9. VIP Program: All Sunday race athletes have the option to additionally purchase a special race package in order to enjoy the ultimate race experience! Our VIP Program includes: special Expo and Start Area parking, access to the VIP facilities in the Start Area and Finish Area, special packet pick-up lines during our Expo, etc. 10. Tide Team: Athletes who have raced with us during five or more consecutive years starting on or before 2010 automatically become Tide Team Members. The 2015 Tide Team Member list is available on our website. If you don’t see your name on the 2015 list, and you believe that it should be, please send an email to info@njmarathon.org with your five (or more) consecutive years listed. We’ll gladly add you to the Team if you qualify. Click here to check out what you’ll earn by becoming a member. The information above is provided as suggestions which will reduce pre-race and post-race stress on Sunday, April 26th. Please take the time to review the suggestions in these weekly updates and plan accordingly. As always, the most effective way to manage stress during your race is to develop and follow well thought out training and racing plans, and adjust your plans as needed on race day. 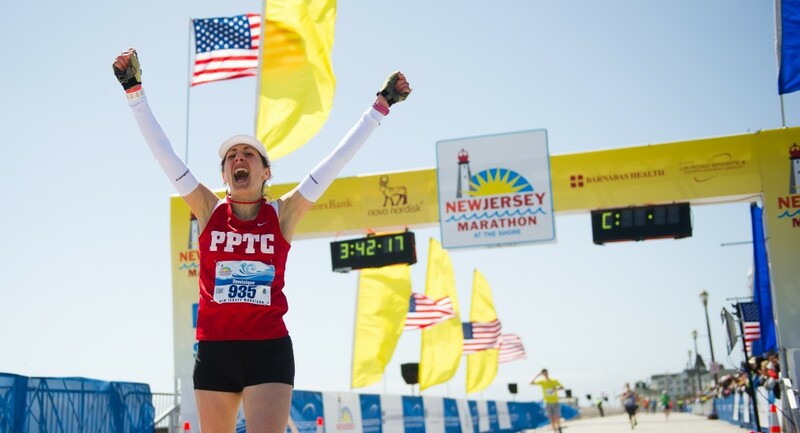 Thank you for registering for The 18th Annual Novo Nordisk New Jersey Marathon weekend which includes the 2014 RRCA New Jersey State Championship races in both the Marathon and Half Marathon distances. In an effort to help make your participation more enjoyable throughout the entire race weekend, this is the first in a series of weekly messages containing important information. Copies of these messages will also be available on our Website. Links to them will be posted on both Facebook and Twitter. This section contains important information to help race day go as smoothly as possible for you. 1. Getting to the Start: We are working hard to improve the experience of getting to the Start Line on race day morning, and look forward to your cooperation in helping to reduce traffic delays. Throughout the fall we looked for ways to recover from the loss of parking lots as a result of increased security put in place after the bombings in Boston last year. We have been working with the security forces to make sure our traffic and parking plans mesh well with their plans. We have added additional parking lots to replace ones which are no longer available to us and we have added additional parking staff to guide you into parking spaces faster. b. Plan on being in the parking lots around Monmouth Park about 75-120 minutes prior to the start of your race. • Take the Special NJ Marathon Race Day Train which will arrive at Monmouth Park Station at 6:05 am. Click here to register for our special race day train. Half Marathon and Relay Athletes and Half Marathon Start Line spectators: If you get off at Exits 105 or 109 of the Garden State Parkway after 6:00 am you will likely miss the start of your race!!! Plan ahead. That means that you should plan to be in the parking lots prior to 5:45 am for the Half Marathon and Half Relay. Marathoners and Marathon Start Line spectators: Plan on being in the parking lots between 6:00 am 7:00 am on race day morning. Please note: Due to the start of the Half Marathon and Relay at 6:45 am, some roads into the parking lots will be closed starting about 6:20 am on race day. With more limited access to parking lots after that time, please plan for extra time to get into the open parking lots. 2. Post-Race: When leaving the Finish Area after your race there are several post-race transportation choices to consider. a. Walk to Long Branch Station and take a regularly scheduled NJ Transit train home. Please note: These trains DO NOT STOP at Monmouth Park. If parked there this is not an option for you. b. Walk to your vehicle which is parked in one of the parking lots around the Finish Area. c. Walk to our Finish Area bus depot (in front of the Ocean Place Resort) for a free bus ride back to Monmouth Park and your vehicle (see below). Please note: Due to road closures from the race, these buses cannot begin the return trip to Monmouth Park until about 9:15 am. Starting at about 9:00 am buses will begin boarding by starting corral order until any backlog has been reduced. We invite you to take advantage of the Finish Line Festival (food, music, raffles, awards ceremonies, cheering for other athletes, etc.). If it’s cool on race day you those warm close you check with us will be waiting for you in the finish area (see below). Pre-paid parking at Monmouth Park: By registering and paying the $5 per car parking fee prior to race day, exiting the parking lots will be much faster this year. We strongly suggest that you take advantage of this option. Click here to register for Start Area Parking. Tickets will be given out with race bibs during Packet Pick-up at the expo. Pre-paid parking near the Finish Area: We offer Guaranteed Finish Area Parking at Seven President’s Oceanfront Park in Long Branch for $15. Click here to register for Guaranteed Finish Area Parking. Please note: There is no shuttle transportation from this parking lot to the Start Area. Gear Check: If you would like to have warm/dry clothing available at the finish of your race, please use the official gear check bag which you will receive when picking up your race packet. It is the ONLY BAG you will be allowed to bring into the secure Start Area in Monmouth Park and the ONLY BAG you will be allowed to carry inside the secure Finish Area. Take advantage of this free service to stay warm and comfortable after your race! 3. Race Day Security Information for Athletes, Spectators, Press, Volunteers and Race Staff: Click here to read about the special race day security requirements at both the Start Area and the Finish Area. If everyone complies with the security requirements, these two areas will be simple to get to and fun places to be on race day for everyone. These safety procedures are intended to allow everyone to feel the positive energy and excitement of race day, in as safe an environment as possible. Please note: There will be no exceptions to these security requirements on race day! It is your responsibility to understand them and to comply fully. Please be sure that any race day supporters read and understand the security requirement which apply to them as well. • Our VIP Program includes special Start Area parking and access to our VIP Tents at both the Start and Finish Areas, in addition to special features during your visit to our Expo. • Race Packet Pick-up: If you aren’t able to pick up your race packet during our normal Expo hours on Friday or Saturday, and can’t find a proxy to pick it up for you for free, we offer a Race Day Packet Pick-Up Service. This service is limited to the first 500 who pre-register for it and costs $25. Click here if you wish to register for this special service. Plan to arrive early to give yourself plenty of time to get you packet, pin you bib on your shirt, check clothing for the finish line, etc. This information is designed to give you suggestions that will reduce pre-race and post-race stress, over the entire race weekend. Please take the time to review the suggestions in these weekly updates and plan accordingly.